Involvement of local people in landslides disaster risk reduction planning, implementation and benefit sharing is the key to a participatory sustainable development approach at a local level. With this approach, Rolpa district which covers an area of 1879 km2 in the foot hills of Nepal Himalayas has been chosen as the study site. Almost 103 landslides were recorded through the participatory method, analyzed and compared with rainfall data and topographic features. Linear regression model showed that occurrence of landslides is increasing significantly over time but rainfall trend is decreasing gradually. Physical infrastructures and properties such as settlement areas, arable lands, roads, forests, spring (water sources) and irrigation canals were found to be damaged. More than 80% of the landslides affected settlements whereas only 20% affected irrigation canals. The ANOVA test showed that the size of landslide has insignificant (p > 0.05) effect on the number of places caused damage except in settlement areas. Moreover, slope failure due to steep relief is not significant rather larger sized and higher numbers of landslides occurred in gentle slope areas (slope ≤ 30°). Almost 80% of landslides occurred between elevations of 1200–2400 m a.s.l. with the majority in northern aspect. This study concluded that the causative factor of occurring of landslides is rain but occurrence further accelerated by anthropogenic activities either changing the topographic reliefs or application of improper conservation measures or both reasons. Major anthropogenic activities could be construction of roads, slope farming practices, houses constructed without due consideration of conservation measures in the recent decades. These results will be helpful to guide land use related planning related to soil and its productivity conservation, and water for the government, development agencies, stakeholders of Nepal, in general, and locals of Rolpa district, in particular to get the optimum benefits from those natural resources. 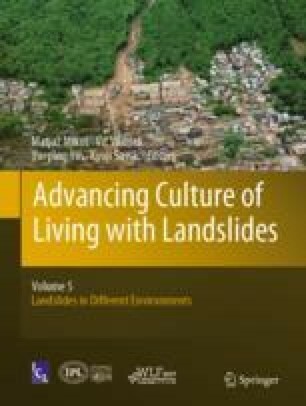 The author is thankful to Bikram Manandhar (ICIMOD), Manoj Bhusal (LNPBZ SP/WWF Nepal), Kaushal Raj Gnyawali and anonymous reviewers from World Landslide Forum for their valuable comments and feedbacks on the manuscripts.